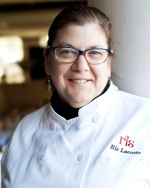 PBS Food talks with Chef Ris Lacoste, of Ris in DC, about her experiences with Julia Child and her participation in the “Cooking With Julia” film that chronicled her 90th birthday party. In the midst of Julia Child 100th Birthday Celebration, Lacoste pays tribute to her legacy. 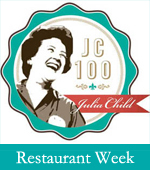 Ris is also participating in the Julia Child Restaurant Week. How did you get to know Julia? I first met Julia in Paris in 1982. She was 70, I was 26. I worked for Anne Willan at her cooking school, LaVarenne Ecole de Cuisine. I typed all of the correspondence between Anne and Julia during the years 1981-82, much of which referred to the beginnings of the American Institute of Wine & Food. Julia and her husband, Paul, came to our graduation in June of ’82. The following year, I was called back from the states by Bob Chambers to be his sous chef for the Great French Balloon Adventure over Burgundy. Julia and Paul joined us for a balloon ride and we all dined together at Au Bon Acceuil on the Montagne de Beaune. Meanwhile, back in the states, my first job was with Bob Kinkead at the Harvest restaurant in Cambridge. Julia was a regular customer, as her house on Irving Street was a couple of blocks away. I made sure to greet her whenever she came in. She often had a burger. I was at the Harvest from 1982-85, minus my Balloon trip. I then moved to Nantucket with Bob to open 21 Federal. Marian and Russell Morash, Julia’s WGBH producers, were Bostonians/Nantucketers who owned a restaurant on the island called Straight Wharf. Julia often visited us there. I would say hello, and she always remembered who I was as she did with most people — she had an amazing memory. At the end of 1987, the team moved to DC and opened Twenty-One Federal South. A year or so after that, Bob Kinkead asked me to fill in for him at a board meeting for a newly created AIWF DC chapter. That was my first experience with AIWF DC, and I have been with the organization ever since. Eventually I became the local chairman, and later a member of the national board. I was in Julia’s company many times; at all board meetings, and many dinners, both private and public. I assisted with her 80th birthday party here in DC at the Hay Adams Hotel, and lead the orchestration for her 85th birthday party at the Willard. 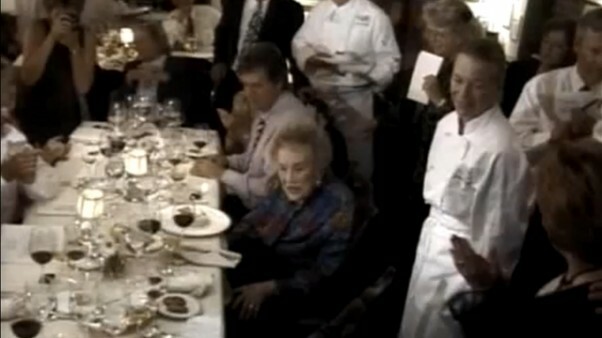 Ultimately, I created the event of her 90th birthday party in conjunction with her kitchen opening at the Smithsonian. Over the years, I had become friends with Julia and her assistant Stephanie Hersh. I visited with Julia at her homes in Cambridge and Santa Barbara. What is your favorite Julia Child story? I have so many memories! The most impressionable was when we were at Au Bon Acceuil in Beaune. It was a family style small French restaurant in the hillside. The first course was a terrine de campagne, passed around for all to take a slice. Then we were served poulet frites. The chicken was passed around in its’ beautifully roasted parts, followed by a huge platter of crispy frites. Our table included the classic large piece of café white paper at each setting. Julia simply grabbed a large handful of fries and placed them not in her plate, but directly onto the paper beside her plate. I fell in love with her right then and there. I thought, “if she can do that, then so can I”. I realized her brilliance much later, as the paper also served as a draining mechanism for the oil from the fries. How did Julia inspire or influence your cooking and career? I loved how she was a student of all things. I am the same way — I work very cerebrally and study things thoroughly. I credit her for that. From watching Julia, I learned her graciousness, which is invaluable in my career. She had a smile for everyone — I don’t know how she did it. A shot from the birthday scene of Cooking For Julia. How did you become involved in the “Cooking For Julia” project? I was a member of the national board of the AIWF. We were involved with the donation of Julia’s kitchen to the Smithsonian. At a meeting in California, I raised my hand and asked to be the host of Julia’s 90th birthday and the celebration of the opening of the kitchen. This was during my time at 1789 Restaurant, and Clyde’s Restaurant Group fully supported the effort. An associate at the time offered to film the dinner. After receiving permission from Julia, 48 hours of preparation and execution were filmed from which “Cooking for Julia” was created. It aired on WETA after her passing. What is Julia’s legacy for chefs and aspiring chefs? To love what you do, and always be thorough in the study of your craft. Be a student forever. And, of course, always be gracious. Do you think Julia could be a TV star today? What is your favorite Julia Child dish/recipe? I wrote several articles for Fine Cooking magazine, and Julia helped me with my Beef Wellington article. It was a big hit. I loved her recipe because she took the time to and stressed the importance of marinating the beef, seasoning it generously, and each individual step necessary to insure that every bite of cooked Wellington was perfection. Tell us about the dinner you are hosting for her 100th birthday. The Smithsonian National Museum of American History approached me to host the Julia Child Foundation. They will be here to celebrate Julia’s 100th on her actual birthday, and the unveiling of Julia’s kitchen as part of a new exhibit on American Food set to open later this year. I offered to host a fundraiser for the exhibit, while at the same time reaching out to the public to celebrate Julia. We will recreate Julia’s 90th dinner party on her 100th birthday. For those who are not able to join us for this event, we will fête Julia all month long at RIS! National Julia Child Restaurant Week is August 7-15, overlapping DC Restaurant Week from August 13-19. Our Monthly Lunch Club Series will feature a Julia menu as well, and is 3 courses on weekdays for $25. Also, our Book of the Month next month will be “Dearie” by Bob Spitz, a new Julia Child autobiography. It’s “All Things Julia” at RIS in August! For more information, visit risdc.com or email events@risdc.com. 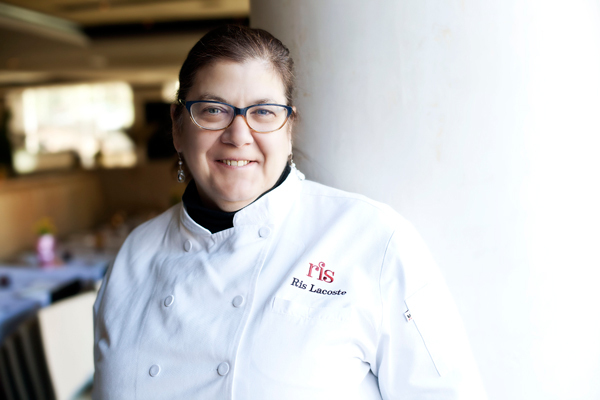 Ris Lacoste is the Chef/Owner of RIS in Washington, DC. She is one of the most respected and dedicated chefs working in Washington D.C. today. She has earned her reputation built upon high-quality ingredients, bold innovative technique, and food that is both familiar and simply delicious.